Future projects would not escape the President's attention. He took keen interest in selecting the site for the new Poughkeepsie Post Office and went to battle over its design. 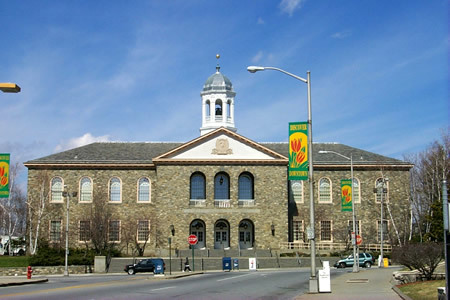 Eric Kebbon, the government architect in charge of the federal project, designed a Greek Revival structure but found his sketches rejected by Treasury Secretary Henry Morgenthau; Secretary Morgenthau demanded the new building be made with irregular fieldstone in the manner of the James Roosevelt Memorial Library and modeled after a picture of the 1809 Dutchess County Courthouse supplied by President Roosevelt's friend Helen Wilkinson Reynolds. Kebbon studied the library and contacted Henry Toombs, but instead of stone, his building design called for more formal-looking granite. 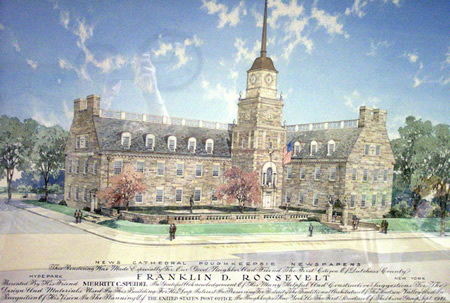 President Roosevelt continually rejected Kebbon's sketches until the design fit his specifications for Dutchess County architecture.